This page covers tips for finding cheap flights to India. We have also supplied a list of airports in India. There is useful information on south Indian airports if you are looking for flights to Goa or Kerala further down the page. India has four main gateways that land international flights. Several smaller airports also run international services. It is usually cheapest to fly to one of India's four main gateways and then take an internal flight to your destination. This is especially useful when travelling to Goa and Kerala (see more information below). Online comparison sites are the best way to compare prices for cheap flights to India. When entering journey details on a price comparison website, experiment with dates to find the cheapest options. If are visiting over the Christmas period you can sometimes save money by travelling on holidays such as Boxing Day / New Year's Day etc. It always pays to book long-distance travel well in advance. Some cheap flights to India include stopovers. Price comparison sites let you specify if you want direct or non-direct flights. Stopovers, if they are reasonably short, can actually be a blessing, allowing you an opportunity to stretch your legs and get a good coffee and save some money on your ticket price. Package holiday deals or charter flights can be very good value for stays of 2/3 weeks, and often fly direct to destinations such as Goa and Kerala. Package deals include accommodation and transfers. Check end-of-season options (April) and flight only offers. Travel agents that specialse solely in India flights and holidays (e.g. Southhall Travel in the UK) can offer good options at competitive prices. Goa's Dabolim Airport [GOI] is the only airport in Goa, and it doubles up as a military airbase. 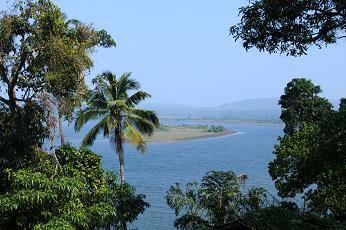 It is 29km from Goa's capital, Panjim. Terminal 1 handles domestic flights and Terminal 2 covers international. International flights arrive in Goa from London, Manchester, Moscow, Warsaw, Zurich, Frankfurt, Amsterdam, Gothenburg, Oslo, Stockholm, Sharjah, Dubai, Kuwait and Doha. Flights from some European / Russian cities are seasonal. no leg-room as these flights are often very cramped. If you are booking independently to Goa, it is usually cheaper and more comfortable to fly to Mumbai, and then get a connecting flight to Goa. Domestic flights can be booked ahead of time online - usually the cheapest option - or on the day of departure at the airport. The flight from Goa to Mumbai takes about 1 hour, and snacks can be bought on board. Trivandrum Internationl Airport [TRV] is 4 km from Trivandrum, Kerala's capital city. 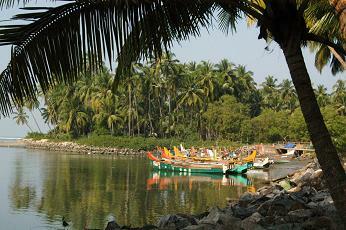 Trivandrum is in south Kerala and is ideal for access to the popular beach destintions of Kovalam and Varkala. International flights enter Trivandrum Airport from destinations including Abu Dhabi, Jeddah, Kuwait, Dubai, Kuala Lumpur, Singapore, Malé, Colombo, Bahrain, Doha, Sharjah and Muscat. Internal flights arrive/depart daily from Delhi, Mumbai, Goa, Chennai, Hyderabad and Bangalore. to all major Indian cities. Many international flights into Cochin originate from the Middle-East, perhaps due to the high number of Keralans working in this area. Other destinations are in south-east Asia. Domestic flights fly frequently between here and Mumbai. Got your flight? 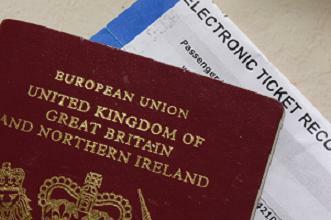 Have a look at our visa requirements page.